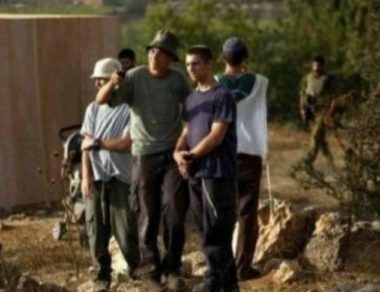 A group of fanatic illegal Israeli colonialist settlers attacked, on Monday at dawn, many homes in Orif village, south of Nablus, in the northern part of the occupied West Bank. Ghassan Daghlas, a Palestinian official who monitors Israel’s colonialist activities in northern West Bank, said the assailants came from the Yitzhar colony, which was built on illegally confiscated Palestinian lands. He added that the assailants hurled stones and objects at homes, in the eastern neighborhood of Orif, hundreds of meters away from the illegal colony. Daghlas also said the colonists tried to burn an agricultural tractor, but were noticed before they managed to carry the attack out. The official said the residents from the Local Guards Committees, which is a group of unarmed volunteers from the village, notice the assailants and chased them out of their village. Owners of three of the attacked homes have been identified as Samir Hashash, Ahmad Shehada and Monir an-Nouri.